This information pertains to App Inventor 1 (Classic). For tutorials about App Inventor 2, go to the App Inventor 2 Tutorials. MakeQuiz and TakeQuiz are two apps that, in tandem, allow a teacher to create quizzes for a student. Parents can create fun trivia apps for their children during a long road trip, grade school teachers can build "Math Blaster" quizzes, and college students can build quizzes to help their study groups prepare for a final. 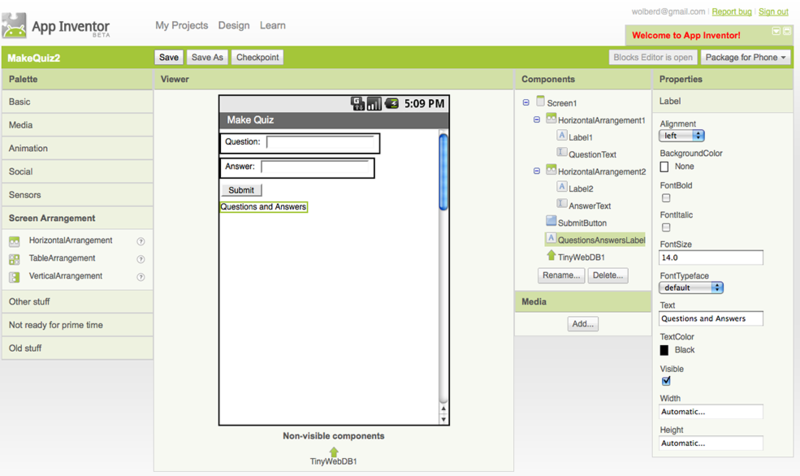 This tutorial will walk you through creating both the MakeQuiz and the TakeQuiz app. This tutorial is a followup of the QuizMe tutorial -- if you haven't completed that tutorial you should do so before continuing. Connect to the App Inventor web site and start a new project. Name it "MakeQuiz", and also set the screen's Title to "MakeQuiz". Open the Blocks Editor and connect to the phone. The user enters questions and answers in an input form. The previously entered question-answer pairs are displayed. The quiz is stored persistently, in a database. TakeQuiz will work similarly to the QuizMe app-- in fact you'll build it using QuizMe as a basis. TakeQuiz will differ in that the questions asked will be those that were entered into the database using MakeQuiz. Input forms for allowing the user to enter information. Displaying lists: serializing a list variable to display it on separate lines. Persistent data: MakeQuiz will save the quiz questions and answers in a database and TakeQuiz will load them in from the database. Use the Component Designer to create the interface for MakeQuiz. When you finish, it should look something like the snapshot below (there are also more detailed instructions below the snapshot). Button Basic SubmitButton User clicks to submit a QA pair. Set the Hint of QuestionText to "enter a question" and the Hint of AnswerText to "enter an answer". Set the Text of SubmitButton to " Submit "
Set the Text of QuestionsAnswersLabel to "Questions and Answers". Put Label1 and QuestionText in HorizontalArrangement1, and Label2 and AnswerText in HorizontalArrangement2. Note that, unlike the original QuizMe app, the lists are empty to begin with. This is because with MakeQuiz and TakeQuiz, all data is created by the user of the app (it is user-generated). The first behavior you'll build is for handling the user's input. Specifically, when the user enters a question and answer and clicks submit, you'll use add item to list blocks to update the QuestionList and AnswerList. SubmitButton.Click SubmitButton This event is triggered when the user clicks this button. add items to list appends each item to the end of a list. Here, the app takes the text the user has entered in the QuestionText and AnswerText text boxes and appends each to the corresponding list. set QuestionsAnswersLabel.Text to QuestionsAnswersLabel Display the lists in this label. Of course, this is not the ideal way to display the lists, but it will allow you to test your behavior for now. Later, you'll modify the displayQAs procedure to display a list on separate lines, and to display each question together with its corresponding answer. Test this behavior. On the phone, enter a question and answer and click Submit. The app should display the single entry in the QuestionList, a colon, and then the single entry in the AnswerList. Add a second question and answer to make sure the lists are being created correctly. When a user submits a question-answer pair, you should clear the QuestionText and AnswerText text boxes so they're ready for a new entry. When the user submits a new question and answer, they are added to their respective lists. At that point, the text in the QuestionText and AnswerText is "blanked out" with empty text blocks (you create an empty text block by clicking on the the block's text and pressing the delete button). Test the behavior. Add some questions and answers. When you submit them, the QuestionText and AnswerText should show only their hint (when a TextBox's Text property is empty it shows the hint until the user clicks it). As is, the app records the questions and answers entered by the user, but only in the phone's temporary memory. 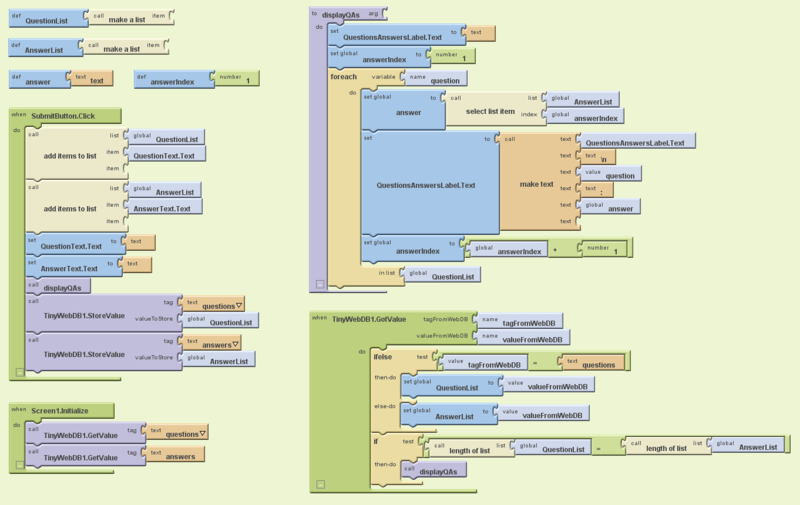 All variables in App Inventor are transient data-- they are stored on the phone and the data only "lives" through one run of an app. When the user closes the app, the data is lost. The MakeQuiz app needs to record the questions and answers in a database. This will allow the quiz creator (teacher) to always edit the latest update of the quiz. It will also allow the TakeQuiz app to load the quiz and administer it to the student. You'll use the TinyWebDB component to store and retrieve the QuestionList and AnswerList to and from a database. 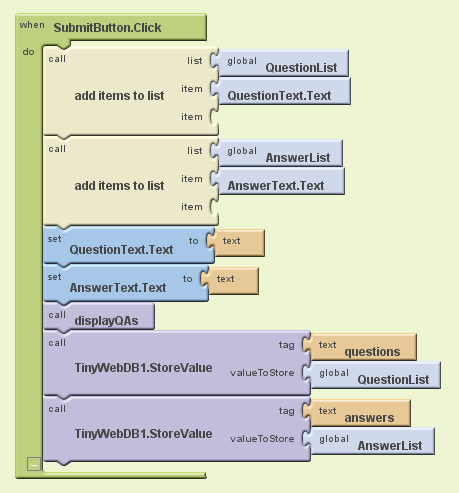 TinyWebDB allows you to store data in AppInventor-compliant databases that live on the web instead of on the phone. The general scheme for storing a list persistently is the following: each time a new item is added to the list, use TinyWebDB to update the database version of the list. Then each time the app is opened (Screen1.Initialize event), reload the database version of the list into the variable. The last two rows of blocks store data in the database. The tag arguments label the data being stored so that you can retrieve it later. 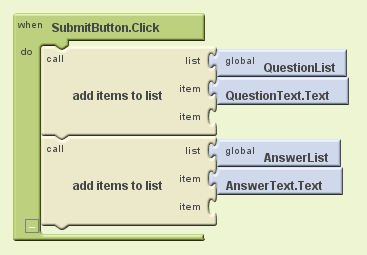 The QuestionList is stored with a tag of "questions" while the AnswerList is stored with a tag of "answers". 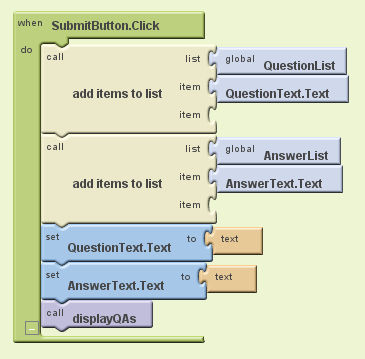 Although our example uses "questions" as the tag, you should actually use your own tag, e.g., "DavesQuestions", because by default, the database entries of all App Inventor programs share the same namespace and so your list of questions may get confused with someone else's list of questions since you both used the same tag. For more information, see Creating a Custom TinyWebDB service. Test this behavior. TinyWebDB stores information on the web, so you can open a browser page to test whether this behavior is working. By default, TinyWebDB stores information at http://appinvtinywebdb.appspot.com . Browse there to check if your data was stored as desired. There will be many entries, as the default service is for testing and is used by many programmers. If you search on the page, you should find the tag-value pairs you just stored. Because the default service is shared amongst programmers and apps, it is only for testing. Fortunately, setting up your own database service is straight forward. For more information, see Creating a Custom TinyWebDB service. Once the blocks for storing the lists are working, you can add the blocks for loading the lists back in each time the app begins. Loading data from a TinyWebDB database is a two-step process. First, you request the data by calling TinyWebDB.GetValue and providing a tag. GetValue only requests the data from the web service. After the request is made, your app can do other things, such as responding to user actions, while it waits for the TinyWebDB web service to send the data. When the data arrives, a TinyWebDB.GotValue event is triggered. When that event occurs, the data requested is in a variable named "valueFromWebDB". The tag you requested is in the variable "tagFromWebDB". 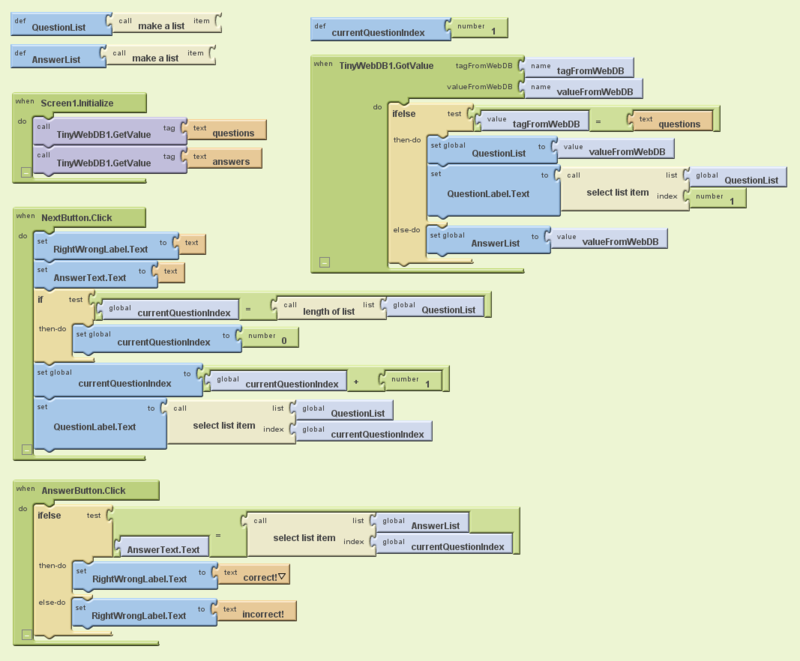 You can access these variables in the TinyWebDB.GotValue event handler. In this case, the app needs to request two things from the TinyWebDB web service, the questions and the answers, so the Screen1.Initialize will make two calls to getValue. When the data arrives and the GotValue event-handler is triggered, the app should check the tag to see which request has arrived, and then load the corresponding list. Once the lists are both loaded, displayQAs can be called to display them. = block Math Compare tagFromWebDB to "questions"
When the app begins, the Screen1.Initialize event is triggered. The app calls TinyWebDB1.GetValue twice, once to request the stored QuestionList and once to request the stored AnswerList. After requesting the data, the app can handle other events while it waits for the web database to answer the request. When the data arrives from the web database, the TinyWebDB1.GotValue event is triggered. Since two requests were made, it will be triggered twice, once for each list. In the GotValue event-handler, the value returned is in the variable valueFromWebDB . The corresponding tag is in tagFromWebDB . The blocks first check to see which request has returned (even though the request for "questions" is made first in Screen1.Initialize, there is no guarantee that the QuestionList will arrive first). 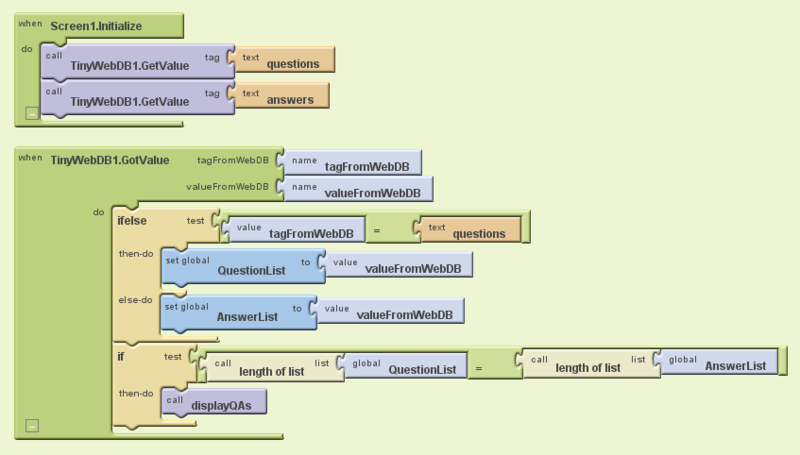 If the tag is "questions", the valueFromWebDB is put into the variable QuestionList. Otherwise (else) it is placed in the AnswerList. At the bottom of GotValue, the app checks to see if both lists have been loaded-- one way to check is to see if the lengths of the lists are the same. If they are, displayQAs is called to display them on the phone. Test this behavior. Select Restart Phone in the Blocks Editor. When the app initializes, it should display the previously entered questions and answers. If you close the app and restart again, the previous quiz should still appear. The version of MakeQuiz you've created so far works: the user can create a quiz and it will be stored persistently in the database. If you can accept the fact that the quiz is displayed in an inelegant way, you can proceed to creating the sister app, TakeQuiz, which lets a user step through the quiz and answer the questions. If you'd like to learn how to display list data in a more elegant fashion, step through the steps directly below. Displaying the data in this way is non-trivial, so you'll start by first displaying a single list, the QuestionList, with each item on a separate line. To display a list on separate lines, you must serialize it . This means to build a single text object with all the items of the list in it and a special character, '\n', between each item. A "\n" within a text object appears as a newline character when displayed. "\nWhat is the capital of California\nWhat is the capital of New York?" name var already in foreach The current item of foreach; rename it to "question"
When the procedure is called, the QuestionsAnswersLabel.Text is first set to the empty text. This is in preparation for the foreach block that comes next, which will build the text in QuestionsAnswersLabel.Text incrementally. The foreach block specifies that the blocks within it are to be executed once for every item in QuestionList. If there are three questions, then the inner blocks will be executed three times. Within the foreach, the current item being processed is named question. 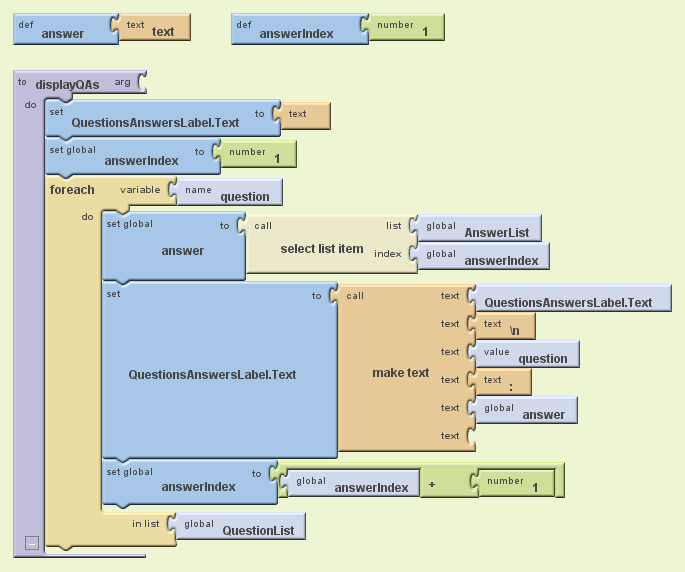 On each iteration, QuestionsAnswersLabel.Text is modified. Each time it is set to its previous value, along with the newline character, "\n" and the current question being processed. When the foreach completes, QuestionsAnswersLabel.Text will be text string with all the items separated by newline characters. As the app is processing each iteration of the foreach , the phone display doesn't change. But when it completes, the text in QuestionsAnswersLabel.Text is displayed on the phone and the items appear on separate lines. Test the behavior. On the phone, add another question and answer and click Submit. Now, only the questions should be displayed and they should be displayed on separate lines. text ("text") Text Initialize the variable answer to text. global answerIndex My Definitions To increment answerIndex , add 1 to itself. The foreach only allows you to iterate through one list. In this case, there are two lists and you need to step through and select each answer as you proceed through the questions. The strategy is to use an index variable, as was done with the currentQuestionIndex in the QuizMe tutorial. For this behavior, the index is a position in the AnswerList, so its named answerIndex. The index is set to 1 before the foreach begins. Within the foreach, it is used to select the current answer from the AnswerList, and then it is incremented. Test this behavior. On the phone, add some more question/answer pairs. The display should now show each question with its corresponding answer, and each question:answer pair on separate lines. 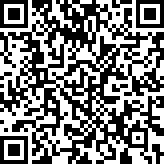 Scan the following barcode onto your phone to install and run MakeQuiz. Building TakeQuiz is simpler; it can be built with a few modifications to the QuizMe app you completed earlier (if you have not completed that tutorial, do so now before continuing). Begin by opening your QuizMe app, choosing SaveAs, and naming the new project "TakeQuiz." This will leave your QuizMe app as is and allow you to use a copy of it as the basis for TakeQuiz. In the Component Designer, choose each image from the media palette and delete it. Also delete the Image1 component, which will remove all references to it from the Blocks Editor. In the Blocks Editor, drag the PictureList to the trash. Since TakeQuiz will work with database data, drag a TinyWebDB component into the Component Designer viewer. When the app begins, Screen1.Initialize is triggered and the app requests the questions and the answers from the web database. When each of those requests arrives, the TinyWebDB.GotValue event-handler is triggered. The app asks which request has come in, using tagFromWebDB , and places the valueFromWebDB into the appropriate list. If it is the QuestionList being loaded, the first question is selected from QuestionList and displayed. Test the behavior. Click Restart Phone App. Does the first question from the quiz you created with MakeQuiz appear? Can you take the quiz just as you did with QuizMe (except for the pictures)? 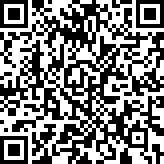 Scan the following barcode onto your phone to install and run Take Quiz. Or download the source code. Incorporate images into the apps. The images will need to be URLs from the web, and the test creator will need to specify these URLs as a third item in the MakeQuiz form. Allow multiple quizzes to be created. You'll need to conceptualize the list of quizzes as a list of lists. You can store data persistently in a web database with the TinyWebDB component. You retrieve data from a TinyWebDB database by requesting it with GetValue . When the web database returns the data, the TinyWebDB.GotValue event is triggered. At that point, you can put the data in a list or process it in some way. 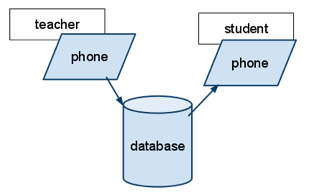 TinyWebDB data can be shared amongst multiple phones and apps. MIT and Google are grateful to Professor David Wolber, CS Professor at The University of San Francisco, for developing this tutorial. Done with MakeQuiz and TakeQuiz? Return to the other tutorials here.